Engraved map entitled 'A Classical and modern map of England and Wales showing at one view its ancient and modern divisions, names of towns etc.' The scale is in Roman miles and British statute miles. The map appears at the front of 'Pinnock's improved edition of Dr. Goldsmith's abridgment of the History of England : from the invasion of Julius Caesar to the death of George II . 17th ed. London : Printed for G. and W.B. Whittaker , 1821. (UoNMSC, LT210.DA/G6, Briggs Collection of Educational Literature). Click through to access the catalogue record. Five months in and my PhD is in full swing. I am starting to collect data on apothecaries from archaeological excavations and from documentary sources. I am very lucky, I have a fully funded PhD through the Midlands3Cities AHRC Doctoral Training Partnership. As part of this package I am encouraged, to apply to the Student Development Fund, which pays for research visits and data collection alongside professional development opportunities. My colleagues, and I, often plan on traveling all over the UK, and even abroad, to access materials, documents, and people, which are integral to our research. In this rush to make the most of our funding however I think there is one resource that gets overlooked. Your own university's Special Collections and Manuscripts collections! 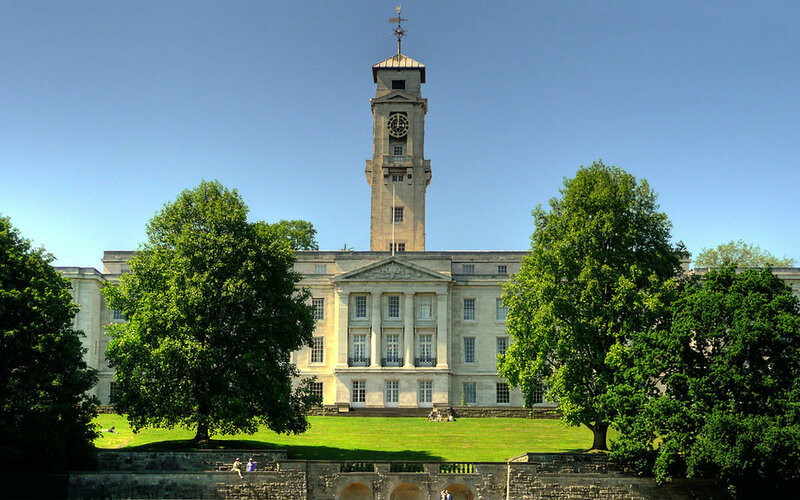 At the University of Nottingham these collections are kept at a separate campus, and are catalogued in a separate system to the rest of the library, making the idea of accessing them even less likely to arise for most students. This is a shame. Having spent a full day browsing all the manuscript sources that arose from a keyword search for 'apothecaries' in the University of Nottingham Manuscripts and Special Collections (UoNMSC) catalogue, I think that these collections are rich, varied, and surprising. It is likely that your university's collections will contain types of documents that you would not think to look at, that can add new perspectives to your research, and that can help you to more fully contextualise your study. My research is looking at the social history and material culture of apothecaries in the early modern period, and looking through apothecaries' bills to the Dukes of Newcastle and Portland, whose papers are kept at the University of Nottingham, I was surprised to find that sometimes the containers in which medicines were dispensed were listed in the bills; in these cases as 'stoppered vials' and 'bottles' (for example in NL 21/1 and Pw C 666). Further there were several interesting letters, in these same collections, that included requests for personal apothecaries to be appointed to court (for example Pw F 2799), or to be sent to serve in the American Revolutionary War (for example Me C 29/30/1-2). One letter even provides insight into the state of pharmaceutical retail in the provincial County town of Hertford, which I would not have otherwise included in my research (Pw F 230/1-2). My doctoral thesis will take me all over the country to Exeter, Winchester, London, Colchester, Leicester, and Birmingham this year alone. These travels will provide the structure and main data for my research. This could stand on its own without the documents I have found in the collections of the UoNMSC, but it would lack context, local interest and texture that enrich the content and value of the finished product considerably. I want to encourage you, my fellow doctoral researchers, to start your research at home. Run a keyword search, discover something surprising that you can find in your own backyard! It was worth the day or two for me, and it might be for you too. Explore these lesser used collections - they might surprise you! I want to thank the incredibly helpful reading room staff at UoNMSC. Me C 29/30/1-2 Letter from John McNamara Hayes, New York [America] to Charles Mellish, Papers of the Mellish Family of Hodsock, Nottinghamshire, c.1160-1991. NL 21/1-3 Bundle of 3 bills from Stevenson and Leeds to the 3rd Duke of Newcastle under Lyne and members of his staff regarding apothecary treatments; Apr. to May 1795, Accounts and related papers of the executors of Thomas, 3rd Duke of Newcastle under Lyne, 1781-1809. Pw C 666 George West the apothecary's bill; 5 Sep. 1766, Papers of John Achard, scholar, 1721-1770, in the Portland (Welbeck) Collection. Pw F 230/1-2 Letter from William Baker, Bayfordbury, Hertfordshire, to [W.H.C. Cavendish-Bentinck] 3rd Duke of Portland; 8 Nov. 1792, Papers of William Henry C. Cavendish-Bentinck, 3rd Duke of Portland (1738-1809), statesman, in the Portland (Welbeck) Collection. Pw F 2799 Letter from Elizabeth Chudleigh, 'Duchess of Kingston', Chudleigh House, London, to W.H.C. Cavendish-Bentinck, 3rd Duke of Portland; 13 Apr. 1766, Papers of William Henry C. Cavendish-Bentinck, 3rd Duke of Portland (1738-1809), statesman, in the Portland (Welbeck) Collection. I am a couple of months into my PhD research now and I am starting to feel like I am in the swing of things - or at least that the mountain of things to do is not quite larger than I can cope with. It has been an exciting and interesting few months with lots of opportunities to be taken and lots of reading to be done! This post is going to be somewhat of a brain-dump of all the things that I have been involved with and started, so I apologise for that, but I wanted to update the blog with what's happening at the moment. The biggest surprise of the PhD process I think, was that so far there have been no surprises! I am back in an academic environment for the first time in 3 years and it feels like home. I enjoy the process of researching and attempting to answer new questions about the past, and I didn't fully realise how much I had missed that. That being said I have not just sat and read for three months as I have both been told I should do, and do kind of wish I was able to! Instead I have been producing work for my supervisors so that we can be sure I am on track and also planning - so much planning. My project is going to involve at least one trip to the USA, two long visits to London institutions, and a handful of brief visits to regional museums with archaeological collections, not to mention the archives and libraries that I need to visit just to complete my literature review. Whilst all of this was in my project plan I don't think that I realised quite how much work it was to plan these trips from securing access to the material that is relevant to me, to applying for money for travel and accommodation to make it all happen. In some ways it does seem like I have spent quite a lot of time on administration. In terms of activities which are not directly related to my thesis I have also been doing some work. I am an editor with a new post-graduate, peer-reviewed journal called the Midlands Historical Review (midlandshistoricalreview.com) which aims to be a venue to publish the best student research in the Arts and Humanities. I am taking the lead at the moment for publishing conference proceedings and papers from student run events throughout the midlands as the editorial board think that this is one venue of student scholarship which receives significant amount of effort but beyond the conference is seldom recognised as valuable. Right now I am also volunteering with the Archaeology Podcast Network - doing a little bit of writing on various archaeological topics - this has served to keep my writing skills in shape whilst providing an interesting non-thesis distraction which is still educational. I am sure that there are many things that I am forgetting, conference papers I plan to give, and writing I want to do, but I think that's all the main things happening at the moment. I am surviving and, despite the tiredness and some minor sleep issues, I am thriving back in the academic world. I don't think there is anywhere I would rather be. Waldseemüller map from 1507 is the first map to include the name "America" and the first to depict the Americas as separate from Asia. There is only one surviving copy of the map, which was purchased by the Library of Congress in 2001 for $10 million. Too early to be thinking about the future? I am now two months into my PhD at the University of Nottingham and feel like I am making some pretty good progress with my reading and literature review, as well as planning my research visits. However I have already found myself thinking about the future. I am applying for a fellowship through the Arts and Humanities Research Council International Placement Scheme at the Huntington Library in California and as part of my PhD. For the application I looked into the wider early-modern research community in Los Angeles and Southern California. One section of that community is the USC-Huntington Library Early Modern Studies Institute, and whilst searching through the centre's website I came across a generously funded Mellon Post-Doctoral Research Fellowship focusing on the Early Americas / Atlantic World. I found myself wondering what is required for successful applications to such programs, both here and in the USA. I know that it is really early to think about this but I have so far been continuously encouraged to plan my personal development, I think that a part of this ought to be focusing this development towards possible future opportunities and aligning it with their job descriptions. Should I develop an appropriate research project I think that this would be one program that I would want to apply to. If I keep collecting these ideas and opportunities this early I will have plenty of options when it comes time to start applying to post-PhD jobs and programs. I also need to decide whether I want to continue in academia, explore museum or other public sector work, or perhaps something else entirely. I think that at the moment I would like to pursue research but museum work has always interested me as well. The main thing though its making sure that it doesn't distract from my current research - because getting the PhD is required for any of these opportunities. I am a regular visitor to LA, since my fiancee lives there, and I am also a regular and enthusiastic visitor to the Natural History Museum of Los Angeles and the La Brea Tar Pits and Museum where she works. Being an archaeologist I am always interested in the human story and both of these museums have interesting stories to tell. In this post I want to focus on The La Brea Tar Pits, which incidentally means the the tar tar pits despite the substance that is still to this day welling up throughout Hancock Park being asphalt and not tar. There is a subtle human story on display at the museum if you know where to look. There is one case of human made artefacts, and there is also a display that explains that one set of human remains (the La Brea Woman) were found in the asphalt but due to valid concerns about sensitivities surrounding the display of human remains, is represented only in a timeline panel of the history of the tar pits. There is more information about the artefacts than the skeleton and looking around the internet it is clear that there remains strong concerns about her status. The wooden and bone artefacts, mainly hairpins and hunting darts, preserved in the asphalt that are on display were mainly found in Pits 61/67. They, are dated to somewhere between 3000 and 9000 years BP (Before Present - which it turns out is 1950). The La Brea Woman is dated to c.9000-10000 years BP. From such a small display, and with the hindrance of the churning nature of the tar it is difficult to draw out a strong story of the human presence at Rancho La Brea at the end of the last Ice Age beyond simple presence. I find myself wondering whether there were any further material culture finds in the other pits and projects, and whether there has ever been any work done to more fully tell the tale in reports, publications, or exhibitions. Questions for next time I visit I suppose! This is the fourth in a short series of posts which I wanted to write in the first half of this year but did not have the time to put together. In this post I wanted to talk about the presentation of archaeology that I noticed on a trip to Florence in April 2017. There are two things that I want to focus on; the Duomo Crypt, and the roads around the Bargello. 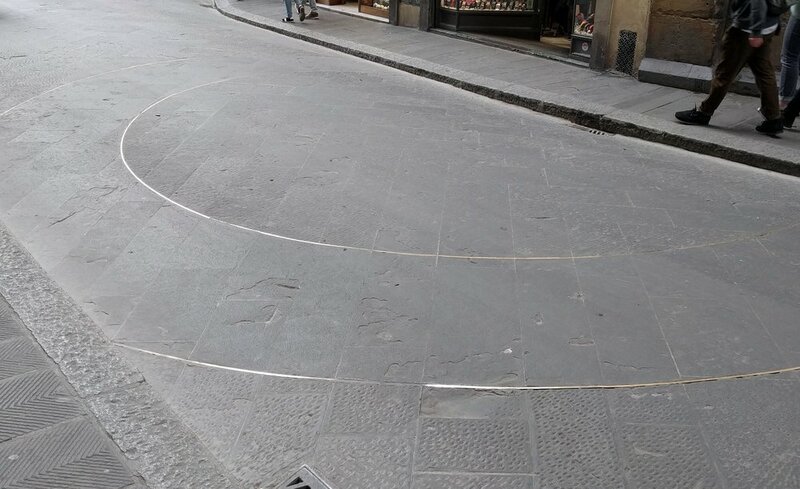 On the streets near the Palazzo del Bargello there were bronze strips inlaid into the road surface that I didn't even notice on the first few times walking past. These subtle indications on the street and a subtle nearby information panel represent and explain that this marked the exact position of the old roman road watchtower that formed the edge of the city during the period of the Roman Empire. I found this to be a really good and subtle presentation of archaeology which doesn't intrude but is clear for those who want to pay attention. These are only two examples amongst many but they made me start to pay more attention and I am excited to find more examples of archaeology out in the world! Museum Photography - surely a key piece of outreach? This is the third in a short series of posts which I wanted to write in the first half of this year but did not have the time to put together. In this post I wanted to talk about issues of public photography in museums, both in permanent collections and special exhibitions. Over the last few months I have visited several museums and special exhibitions in Los Angeles, the UK, and Florence and I noticed that there were often some restrictions on visitors taking photographs. Normally this was in special exhibitions, especially those where objects had been lent from other institutions. One example of this was the Michelangelo and Sebastiano exhibition at the National Gallery in London. This was an exceptional exhibition that collected real and facsimile pieces of art from all over Europe including some never before seen pieces for the UK lent from the Vatican. The fact that no photography was allowed bothered me. I understand that museums need to balance broad access to culturally important objects, ideas, and art, with intellectual property and other issues surrounding ownership. This both protects the artist or copyright holder (if there is still copyright on a piece) and helps to ensure that information about context and accepted interpretation is communicated effectively. However I think that the balance often goes too far. If the issue is interpretation then having a strong digital element to an exhibition - perhaps even so far as a small catalogue with interpretation texts would help. If copyright is an issue I find it very difficult to be persuaded that a snapshot taken by a visitor to an exhibition could in any way replace the experience of the piece of art itself or be of a high enough quality to damage revenue streams from exhibition merchandise. I think the fact that in most core collections galleries these restrictions are not there, or are at least relaxed supports this. I find it amazing that there seems to be a denial that we live in a visually dominated culture. The natural progression from that thought is that visual communication of culture, especially democratised by visitors showing their family art and artefacts that they have seen in a museum alongside verbal descriptions of how much they were affected by the piece is one of the best ways to drive interest and even perhaps visitor numbers. 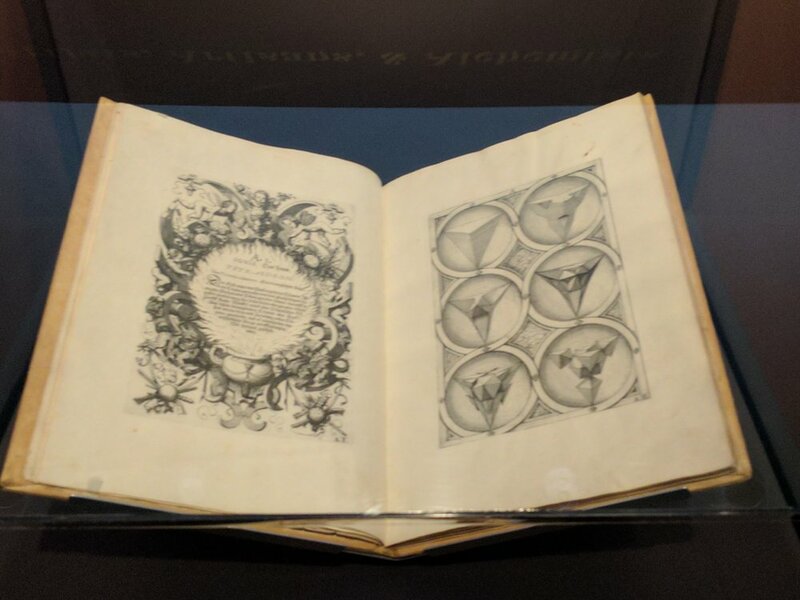 This can be done well; in the recent Art of Alchemy exhibition at the Getty photography was allowed and a significant number of the objects on display were on loan from other institutions from all over the world. For me this made the exhibition better, I was able to take snapshots of the most interesting exhibits to help inform my own further reading and to share with similarly interested people who were unable to get to LA or who needed more information before deciding to go to see the exhibit in person. There is of course one issue that I have not mentioned; the conservation needs of the objects, documents, and art. In some rare cases there may be objects that are too fragile for any photography - this was the case at the Opus Angelicum exhibition at the V&A that I saw. In other cases - most in fact - a "no flash" policy would be enough as the gallery lighting choices would protect the art and objects. I think that it is clear that where possible - and in my opinion that should be almost always - photography should be allowed and even encouraged to broaden and democratise access to art, archaeology and culture. Funding a PhD - is it worth the emotional effort? This is the second in a short series of posts which I wanted to write in the first half of this year but did not have the time to put together. In this post I wanted to talk about the trials and tribulations of attempting to fund a PhD in the UK with a self-conceived project. I feel able to do this now that I can sit here as a fully funded Midlands3Cities PhD candidate at the University of Nottingham. My funding purgatory started in 2014 when I had graduated from my MA in Medieval Archaeology at the University of Sheffield and wanted to continue on to PhD level in Sheffield. I applied to the university and was offered a place to study my PhD almost immediately, at the same time I also applied to all the possible funding option available from School level prizes up to the White Rose College of Arts and Humanities. I did not necessarily expect to be successful straight away and so when I was told that I was placed number 57 on the reserve list for the White Rose scholarships I was disappointed but not disheartened. From that point, and even during that initial application process I was consistently told that I had an "excellent" self-conceived project which eventually had been contributed to and improved by at least 8 academics from multiple institutions. I applied a second time to the University of Sheffield in 2015 for 2016 entry and also to an external funding scheme with the Wellcome Trust. I was rejected from the university funding schemes (as far as I could tell this was at least partially because I had been unsuccessful the year before) and I was unfortunately unsuccessful with the Wellcome Trust application. At this point I broadened my horizons and decided to apply to four universities; The University of Amsterdam. University College Dublin, the College of William and Mary, Williamsburg VA, and The University of Nottingham in the UK. I had started to feel like I had failed to find the "magic bullet" which would allow me to be successful in my funding applications. I was still being told that my project was "excellent" and that I had a great chance of getting funding. If I am honest this was even more disheartening as I was failing to achieve the level required, at least that is how it seemed to me. In this case I missed out on a place at the College of William and Mary by one spot, and was rejected by the Irish Research Council. I was finally successful however in the Midlands3Cities Arts and Humanities Research Council Consortium at The University of Nottingham, an excellent institution and the most generous funding of any that I applied to. I am happy with my supervision team's expertise and support so far and think that, tending to cliché as these kinds of things do, it worked out for the best. I relate this story not because I am angry with any institution, academic, or funding body. In fact the support and input of so many respected academics in different countries and institutions was, I think, ultimately invaluable to the shape and potential success of my project. I recognise that this funding situation reflects grant writing and other funding more generally in the Arts and Humanities in the UK, and I think that I am able to take the positive from this. Now that I am funded I can see that experiencing funding rejection will be a skill I will use constantly in academia or museums or any area where I will have to apply for funding for work that I want to do. Instead I relate this story to make a less depressing / utilitarian point. I wanted to force people who were considering applying for a PhD and PhD funding, especially with a self-conceived project to consider whether this kind of rejection is worth it. Not everyone can successfully apply for funding the first time, or even the second. It is something which I wish I had been more prepared for in 2014. In my opinion it is absolutely worth it: a 3 to 7 year period (depending on the norms where you plan to study) working on something you aren't 100% sure you want to study is most likely worse than the process of applying for funding, even repeatedly. However this is something which I think each person has to decide for themselves. I recently started my PhD at the University of Nottingham in the archaeology of Early Modern apothecaries and I will have more posts about that across the next three years. First however, I have several posts that I wanted to write over the last nine months but did not have time to get to. The first of these is on my recent seven months stint in UK Commercial Archaeology. I spent January to August this year (2017) working as an Archaeological Technician for Albion Archaeology in Bedford. I should start by saying that I had an amazing time in spite of the rain, snow, frozen ground, and slight sunburn that only seven months in Britain entails, weather-wise. It was an invaluable opportunity to see what pre-development archaeology is like in rural areas which are commutable to London. This is an area where there are a lot of housing and other developments occurring but is also an archaeologically rich area with prehistoric, Roman, Saxon, and medieval remains often uncovered during commercial work. The first thing that I noticed was the distinct differences in practice between research archaeology (my only previous other excavation experience, although extensive). There are the obvious differences; speed stands out, as does the single context recording. Speed because there is significantly more pressure to get work completed within a specified time - this is usually related to budgetary concerns but in the case of at least one site I worked on it was because a school had to be built before the start of the next academic year which obviously had a minimum duration of construction. The recording was different because there was very little planning, only a pre- and post-excavation plan which was mostly completed by GPS. The context sheets and other recording was more or less the same but I was used to planning a small trench or unit layer by layer as each context was excavated. In commercial the focus was more on just finishing features. There are advantages and disadvantages to both approaches and I do not intend to make a value judgement on process, however I will emphasise one point that I think needs to be valued more; and that is the results, data, and other outputs of commercial archaeology. This is in someways the coalface of archaeological research; there is no way that researchers could generate the quantities of data that the commercial sector does, not with all the research grants in the world. The great shame of the whole situation is that the data from most commercial units is either never published or is not made use of by those who are trying to do synthetic research with disparate data and generating new knowledge. Additionally there is the value of working in commercial archaeology for anyone hoping to work within any of the disparate fields with which archaeology is associated. I personally think that doing a 3-6 month stint in commercial archaeology should either be a required component of an archaeology degree, or at least be required for a lot of archaeological work, most especially anything which has to do with excavation or dealing with site archives in museums. The one negative that I took away from this period of work is that archaeologists in commercial field work are still working in the an arena where pay and conditions are not commensurate with the skill, importance, and value of what is usually a graduate profession. Things are generally getting better and I do think the CIfA is helping, albeit slowly and guided by people who perhaps are less concerned with diggers than the status of more senior archaeologists. In one way the number of large infrastructure projects which are upcoming (HS2 for example) will make the current shortage of field staff even more acute which will improve wages but likely not conditions. I do hope things improve soon because as things stand it is very hard to see many people being able to make a successful career in the sector. This period was one filled with good friends, archaeology which I had not had the chance to dig before mainly prehistoric things, and I have to conclude that despite the shortcomings of the profession and the slow improvements, the sorts of people attracted to archaeology, either academic or commercial, are my kinds of people. Most likely you can find them in the nearest ale pub. Recently I saw a video on the excellent YouTube channel Kurzgesagt – In a Nutshell. Entitled 'A New History for Humanity - The Human Era' it explored the idea of the Holocene calendar which was first proposed in Nature by Cesare Emiliani (1993) [PAYWALL]. One version of this calendar would make the current year 12,016. Emiliani's idea was to introduce cardinal numbering for the 'Human Era' he was frustrated with the ordinal numbering of the Julian and later Gregorian calendars that measured years in two directions from an origin point which has no relevance for non-christian cultures. If we take as the origin point ~12,000 years ago the resulting calendar will approximately cover the period from the late Mesolithic / pre-ceramic Neolithic when humans first began shaping their environment in 'permanent' ways; terraforming the Earth to their needs. Archaeological sites that relate to this period include the site of Göbekli Tepe in Turkey, and Jericho in the Palestinian Territories. The video from Kurzgesagt contains a beautifully illustrated timeline of human history if this were the starting point of our calendar encompassing the whole world and varied cultures as the new calendar system has no specific cultural ties despite simply being the Gregorian calendar plus 10,000 years. Whilst it is likely impractical to have the world change its calendar in this way (although most other proposals for calendar reform are significantly more problematic to implement   ). It does generate some interesting questions for archaeologists and historians. Namely, how does the perception of human history change when the calendar numbering that we use firstly has no artificial separation of events before an arbitrary date, and those after it, and secondly encompasses the whole period of humans constructing permanent structures or permanently altering the Earth? There is a lot to unpack here but I want to start with the artificial distinction between periods of history, often attached loosely to an arbitrary date. For example, I am a medieval and post-medieval archaeologist. These two periods, in Western Europe at least, have no clear dividing point; a point when the medieval ends and post-medieval begins cannot be definitively defined. Some academic societies, conference, or other places that need to define a terminus to one of these two periods claim it to be 1500, others 1600, yet others (in Britain at least) the end of the Tudor period of monarchy. I think its clear what the problem with this is, to the people living through these supposed transitions there was instead continuity. The same is clearly true of the people who lived through what became the BC/AD divide. I think therefore that this is one of the key strengths of the calendar. However, there can be significant debate over when the calendar should begin. The first 'permanent' structures for which we have archaeological evidence is, at first glance a reasonable place to begin such a calendar. For the non-archaeologist this would seem to be the period when humanity is first making a deliberate and lasting impact on the face of our planet. However, this would then define the art produced by anatomically modern humans in the Upper Palaeolithic and Mesolithic as not belonging to the Human era. You would start to run into the same issues; the transition to monumental temples and the first cities would not have been a sudden one but rather part of a continuity that includes the permanent and semi-permanent coastal fishing communities of the Mesolithic and the nomadic groups of the Upper Palaeolithic. Would it perhaps be better then to start the Human Era calendar at the first anatomically modern humans, the first Homo Sapiens? I have no answer, and I am inclined to think that this would be a problematically deep amount of time for any calendar to be useful. I am interested in the debate and any of your views. The next thing that I think is most interesting, and which is highlighted by the video, is the shift in perspective that this change of calendar could contribute to for those studying the past. The use of the Gregorian calendar, which has become an world-wide standard for most non-religious matters, undoubtedly contributes to a colonial notion of the superiority of Western / Christian culture. How much the calendar is a factor can be debated, but as one amongst many it contributes to problematic readings of history and the supposed 'sophistication' of different groups across the globe in the same time period. Would it not be better then, to pin the calendar to a non-religious, non-western origin or zeroth point? Whilst the construction of Göbekli Tepe is now thought to be the first permanent site of worship that can be recognised, that worship was to a deity or force that has been forgotten. The construction of that site, and Jericho are deep enough in time to be divorced from any anachronistic concepts of nationality, race, or religion. From this starting point would it be possible to see with the same wonder the rise of agriculture, permanent settlements, and increasingly complex societies across the world without judgemental comparisons? I would hope so, and I would also hope that archaeologists and historians who deal with this depth of time make the effort to do so regardless of the calendar that they are used to working with. The final thing that this video and Holocene Calendar idea touch on without explicitly mentioning is the idea of the Anthropocene. That is the new geological epoch that many agree we currently live in. This proposed epoch encompasses the period when humans have had a significant and potentially irreversible impact on the Earth's geology and ecosystems. This is a very similar idea to that which Emiliani used to propose the start of his Holocene or Human Era calendar. Naturally these two ideas run into similar problems. There are proposed dates for the start of the Anthropocene from c.8000 years ago [PAYWALL] (almost the entirety of the HE calendar), right up until 1964 [PAYWALL]. The Anthropocene by definition is the human epoch; what that means is still being debated but the similarities in idea to the HE calendar are too striking to ignore and so perhaps the start of both should be the same date? Even if that were agreed, I am sure that there would be endless debate about what date that should be. I am interested in what you think? Are the Holocene Calendar/Human Era the same as the Anthropocene? If not why not? And when should each of these start? This is the video which inspired me to delve more deeply into calendars and the Anthropocene. I encourage you to subscribe as every video that they produce never fails to be interesting and thought provoking. I was recently in Los Angeles and so, as always, I made a point of visiting the astounding Getty Center complex which contains the Getty Museum, Research Institute (GRI), and Conservation Institute (GCI). This complex is a mecca for art and archaeology lovers in the Southern California area. My visit this time though was specifically to attend the exhibition Cave Temples of Dunhuang: Buddhist Art on China's Silk Road, put on by the GRI and GCI. Not only was this an opportunity to learn about the fascinating art and archaeology of a region that I had never been exposed to, but it was also an opportunity to experience some novel exhibition techniques. It has been a while! I have not blogged since August last year. Its been a hectic year for me; working towards getting PhD funding and ultimately being unsuccessful, trying to get long term work in museums or archaeology and again being unsuccessful. I know that sounds like a lot of negative but its been a good year too, I got engaged, have had some wonderful experiences and discussions with archaeologists from across the globe and visited some excellent museum exhibitions. A photograph from a stunning exhibition in Los Angeles that I recently saw. All will be revealed in a later post! It may take me some time to get back to regular blogging but I will be trying hard to post something at least once a month. In the transition from a tumblr to this Squarespace blog some of the older posts, especially the review of the Monasticism conference from 2014 got lost. Thankfully that one is archived on the blog of Assemblage the Graduate Journal of Archaeology at the University of Sheffield. If like me you are based in or near Sheffield then I want to bring ‘Archaeology in the City’ to your attention. This community outreach program run by students at the Department of Archaeology at the University of Sheffield is an excellent way to get involved with and more informed about archaeology. They regularly run events such as the Woodland Heritage Festival in May/June. They also run a monthly talk in the Red Deer pub entitled ‘Archaeology and Ale’ and if you can’t make it then there’s a podcast! Its July 24th 2015 and that means its the international Day of Archaeology! “The Day of Archaeology project aims to provide a window into the daily lives of archaeologists from all over the world. The project asks people working, studying or volunteering in the archaeological world to participate with us in a “Day of Archaeology” each year in the summer by recording their day and sharing it through text, images or video on this website. The resulting Day of Archaeology project demonstrates the wide variety of work our profession undertakes day-to-day across the globe, and helps to raise public awareness of the relevance and importance of archaeology to the modern world. We want anyone with a personal, professional or voluntary interest in archaeology to get involved, and help highlight the reasons why archaeology is vital to protect the past and inform our futures. First from the Coin Hoard Project at Jersey Museum where my friend is a Conservation Technician. They shared their day last Wednesday and talk a little about the project to remove coins from a hoard. Next from ASI who have shared some great photos of their archaeologists at work with one-word captions. All the way from Canada! And, finally an entry from an archaeologist detailing a fascinating history of Mexico City and the issues with protecting and managing archaeological sites and artefacts in such a dense urban environment. I am planning, in a series of posts to edit down some of the essays that I submitted for my two archaeology degrees for a more general audience. I think that many of the topics covered will be of interest to you all. I have attempted to remove jargon and keep references down to a minimum. Feedback on this idea for a series of posts is welcome. Discuss how the changing roles of museums and other curatorial bodies in the UK has provided both opportunities and hindrances to material culture studies in the last ten years. UK Museums in the last twenty years have been under increasing pressure from multiple external agencies. This is in part because of an increasing need to prove that they are worth funding and in part because of new government policies that aim to increase social inclusion through museums. These two pressures are the main reasons that the responsibilities of curators and their studies of the material culture under their care have changed. In this blog post/essay I will refer only to archaeological examples but that does not make the conclusions drawn any less relevant to the rest of the museum sector although different types of museum will have their own subtleties. One of the few arenas for the public to experience ‘real’ interactions with past material culture is in museums. Museums articulate and challenge preconceptions of the history and identity of a nation, society or culture and their central use of objects differentiates museums from all other institutions (Kavanagh 1989: 125). This means that ‘History museums’ must move with the theoretical changes in material culture studies or risk being intellectually outdated (Kavanagh 1989: 135). The first change affecting the role of the museum is financial. Museums have never been a statutory service in the UK and as such are the first to have to justify any public funding they receive. This is not an issue for the national museums run by charitable trusts such as the British Museum. Local Authority Museums, however, are usually run directly by the council in whose jurisdiction they are located and thus have to account for their budgets to government. This need to justify public income has led to an increase in ‘Museum managers’; people whose job is solely to create a museum that can prove that it is value for money. This focus is somewhat in conflict with the traditional role of curators. It makes the study, preservation and presentation of the past somewhat incidental. It has also led to market ideology becoming more and more central to the running of local authority museums in the UK (Lawley 2003: 75). The modern museum focuses on the visitor first, and some go as far as to consider these people to be customers. A seemingly minor semantic shift that entirely changes the nature of the relationship; visitors come to view the museum, customers come to receive a service or product from the museum. The fact that this product is possibly knowledge rather than a tangible object (gift shops notwithstanding) does not alter the fact that the customer not the objects must come first in this conception of a museum. Further the need to demonstrate that culture can be value for money is problematic because individual interaction with museums is incredibly complex to model and assess (Mason 2004: 49-73). One part of widening access to museums is what might be termed popularisation, leading to galleries and exhibitions being designed based on a supposed customer experience. This approach is problematic due to a lack of understanding of that visitor/customer experience. However, most museum services recognise that a large gap exists in the market to popularise archaeology and that museums should be filing it; it is currently filled by journalists and fiction writers in various mediums (Skeates 2000: 112). This tactic appears to work to increase visitor numbers; the number of museums in the UK was increasing year on year until the year 2000 (Foley and McPherson 2000: 164). However it cannot be ignored that there is a gap between the purposes of museums for the curator and the museum visitor. Another aspect of widening access to museums is the increasing trend towards socially conscious museum management. This is a little difficult to define but most commentators seem to agree that it includes using the material culture in museums “for both reading the past and reading ourselves” (Crowther 1989: 44). Most people find their interaction with the past rewarding when objects are presented in their own setting or in reconstructions and ideally linked to their own identity on some level. Object interpretation should illuminate the role of that artefact in the ‘operation of society’ both its original society and also others it has come into contact with. Thus museums need to acknowledge the multi-voiced narratives of the past, something that can be difficult when the major museums in European cities tend to show deep discomfort with imperialist aspects of their own heritage. The UK government in 2000 set out social inclusion as a policy applying to the all museums under local government control, although many commentators claimed that most museums already had social inclusion high on their priorities (Lawley 2003: 82). Some writers think that initiatives emphasising social inclusion in museums are patronising and compromise the future of, museums in Britain. Others think that social inclusion is empowering . Whichever is true the museum collection was no longer the central function of the museum (Edwards 2007: 101). It had been replaced with a visitor focus, and the need to promote social responsibility and education in museum environments. Thus a focus on non-elite, everyday material culture is encouraged as it is thought that this is more likely to engage more sections of society. This aspect of the changing roles of museums in recent years is, interestingly, the one that has provided the most opportunities for material culture studies as the need to think pluralistically about cultures and the objects that they created inevitably leads to in-depth interpretations of that material culture. This post has been necessarily broad as there are many issues relating to material culture studies in museums, especially in the volatile environment of uncertain funding and increased governmental pressure to justify services. The social inclusion agenda of government gives great opportunities through the analysis of material to represent the multi-voiced narratives of the past and thus the multi-cultural present state of the community likely to view the collection. Museums can enhance social inclusion and they have the potential to promote tolerance and challenge stereotypes. Financial pressures however have made the role of the curator, the material culture specialist, expand into new areas. There is now a need to be a manager and an analyst of visitor reactions and interactions with the displays under curatorial care. This has made material interpretation a smaller part of the job, perhaps restricting the expansion of material culture studies in museums. However, the success of overtly object focused projects such as the ‘A History of the World in 100 Objects’ (BBC 2014) shows that there is still visitor interest in the insights that material culture studies in museums can provide. BBC (2014) A History of the World: The 100 British Museum Objects. http://www.bbc.co.uk/ahistoryoftheworld/about/british-museum-objects/ [Accessed: 17/05/2015]. Crowther, D. (1989) ‘Archaeology, Material Culture and Museums’ in Pearce, S.M. (ed.) Museum Studies in Material Culture: 35-46. Leicester: Leicester University Press. Edwards, E.C. (2007) ‘The Future for Curators’, Papers from the Institute of Archaeology S1: 98-114. Foley, M. and McPherson, G. (2000) ‘Museums as Leisure’, International Journal of Heritage Studies 6(2): 161-174. Kavanagh, G. (1989) ‘Objects as Evidence, or Not?’ in Pearce, S.M. (ed.) Museum Studies in Material Culture: 125-137. Leicester: Leicester University Press. Lawley, I. (2003) ‘Local authority museums and the modernizing government agenda in England’, Museum and Society 1(2): 75-86. Mason, R. (2004) ‘Conflict and Complement: An Exploration of the Discourses Informing the Concept of the Socially Inclusive Museum in Contemporary Britain’, International Journal of Heritage Studies 10(1): 49-73. Skeates, R. (2000) Debating the Archaeological Heritage. London: Duckworth. An update to the stories I was covering in my last original posts. Regardless of this good news however there are still site under threat from this group and, if such a calamity was to occur I would still be strongly in favour of an academically backed reconstruction as soon as possible. Culture and History on the Front Line: Part 2 – What can be done? In part one I outlined, in the briefest terms, the cultural crimes that Islamic State are perpetrating, and how this is an issue for all the people of the world. In this post I will look at the few things we can do. The first thing that may spring to mind is to criminalise the destruction of cultural properties and important archaeological sites. The trouble is that this has already occurred; since the 1862 Lieber Code there have been laws in place in parts of the world to protect cultural and historical sites and buildings in times of war. This was finally brought to an international level in the 1954 Convention for the Protection of Cultural Property and its Additional Protocols. Under these documents the acts of IS are undoubtedly war crimes as the Director of UNESCO, Irina Bokova, has repeatedly said in the media. Unfortunately there are several issues with this route of protection, first that it is not respected by ISIS; they were not a signatory to the convention. Secondly that its enforcement is hampered by the fact that Iraq and Syria are still in a time of war, and finally because the regulations prescribe no punishment for cultural war crimes. So it seems that this route will only become a source of restitution after the fact and in the event that some IS soldiers and leaders are captured after their defeat. Another option, that is currently underway in the case of Mosul Museum, is to construct a virtual replica of the museum before it was destroyed. This has the benefit of being crowdsource-able, in fact it relies on the donation of photographs and videos of the museum and its collections from anyone. Additionally the reconstruction, using photogrammetry, can be used to produce replicas of the lost items albeit at a lower three-dimensional resolution. If you would like to contribute and have images from the museum, likely before 2003, then please visit http://projectmosul.itn-dch.net/ and get involved. The final main option I will feature here is the most dangerous, and yet is underway in some parts of IS occupied territory and other areas they have recently lost. In a similar way to the 2014 film by the same name, a small group of academics is crossing regularly into Syria from Turkey to record, hide and protect archaeological sites, material culture and documents. This approach is best suited to protecting small items and not entire sites but it has immense value, so much so that should it be offered I would be tempted to join them. So overall then what can be done? It seems most likely that, as troubling as it is to believe, the main responses and solutions will be after the damage has been done. I would argue, as Simon Jenkins does in the Spectator, that reconstruction must be a priority. I would add that it should not take the over twelve years that UNESCO has been wrangling about how to deal with the empty caverns where the Bamiyan Buddhas were seated before their detonation. This reconstruction should be swift and utilise all of the available knowledge and technology. Of course this will not compare to the originals in many ways but it will spit in the face of fanaticism and will give the chance of a tourism boost to the region, allowing everyone to experience the history and archaeology that will otherwise be lost. The destruction of statues in the Museum of Mosul by Islamic State Militants. AFP/HO/Media Office of the Nineveh branch. There have been many news stories about the recent destruction of antiquities in the areas of the Middle East currently controlled by ISIS, ISIL or Islamic State. This post will not make claims to understand the totality of the conflict in the region and its many threads. Instead I would like to focus on the destruction of archaeological and historical artefacts, documents and sites and how they relate to a bigger problem; international apathy. Cultural erasure as a weapon of war is likely as old as warfare. The most famous recent example (pre-dating the current Syria/Iraq/Lybia/Nigeria situation) is the Afghani Taliban’s destruction of the Bamyian Buddahs in 2001. At the time there was international outcry, this was the destruction of a religious monument and cultural site of worldwide importance. One that showed the history of Buddhism in the region. My question then is why is there no such outcry this time around? Is it because there are no believers in the Assyrian gods who have been struck down from their museum pedestals? If so then the world and media fundamentally mis-understand the importance of history, of place and of the traces of the past left behind. There is a reason that the destruction of archaeological, historical and culturally important sites and monuments is classed as a war-crime; erasing the history of a place and people erases those people. No matter how far removed we feel from the religion and time represented by these statues we cannot accept their destruction quietly. These artefacts contribute to the history of all mankind, not just those long dead Assyrians, or even the current occupants of the deserts in which they resided. As Boris Johnson pointed out in a recent Facebook post, art-historically these images a clear predecessors of Greek aesthetics which themselves are one origin point for western art styles. That is just one of the many reasons why these sites are key to the common history of modern civilisation, and it can feel like shouting to the wind trying to convince the world of them all. The trouble is that that is exactly what we need to do; educate and keep shouting! And I don’t just mean school children or those of us who choose to pursue history, archaeology or related subjects at university or for a living. I mean EVERYBODY. Everybody has a stake, the history of one culture belongs to all of us; we are all human and we all should be able to learn the lessons of the past. Regardless of the fact that there are reports many of the statues destroyed in the Mosul museum were replicas, there were genuine originals in that gallery and the two other main galleries where no film has been released, and I foresee the potential for even more destruction. ISIS has already stated their aim to destroy the sphinx and pyramids. In Libya there are extensive and important Roman remains that we now have to consider under threat. In Nigeria where Boko Haram operates there are the remains of the Walls of Benin and Taruga (the under-representation of African history and archaeology is aanother topic entirely). The loss of these, just as we appear to have lost large parts of Ninevah, Nimrud and Hatra would be a further blow to the shared history of the human race. Something must be done, but what can we do? Gannon, M. (2015) – http://www.livescience.com/50072-isis-attack-on-ancient-history.html – accessed 18/3/2015.